We'd love to stay in touch! Please use the form here to sign up for our mailing list. We promise to never sell or knowingly share your information and you can unsubscribe at any time. In addition to owning Casa de Linda Art Studio in Wimberley, Texas, Linda Calvert Jacobson is an accomplished artist, represented in galleries and fine art fairs around the country. 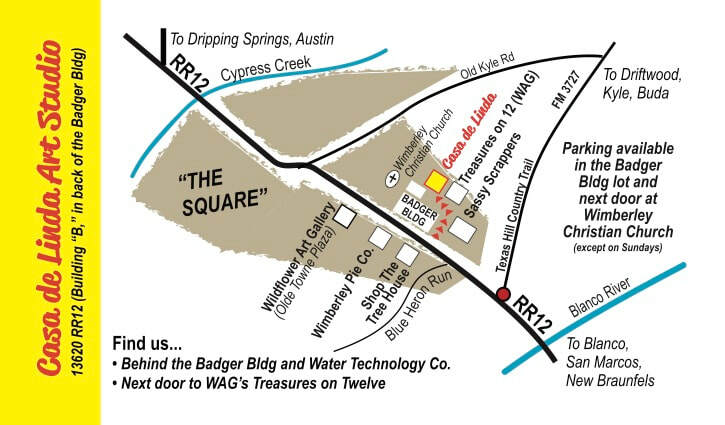 Linda's husband, David, runs their Wildflower Art Gallery, also located in Wimberley. When you sign up for this mailing list, you'll occasionally receive e-mails about Linda and her art and news about what's happening at Wildflower Art Gallery. Be sure to check the "Casa de Linda Art Studio news" to also receive news about classes. To learn more about Linda, her art, and Wildflower Art Gallery, please visit www.lindaswildflowers.com. PS Mail like this will often end up in the spam folder. Please add linda@casadelinda.com AND linda@wildflowerartgallery.com to your address book to help ensure that our emails get to you! Thanks! Also check this box for Casa de Linda Art Studio news -- Classes, workshops, camps and more!